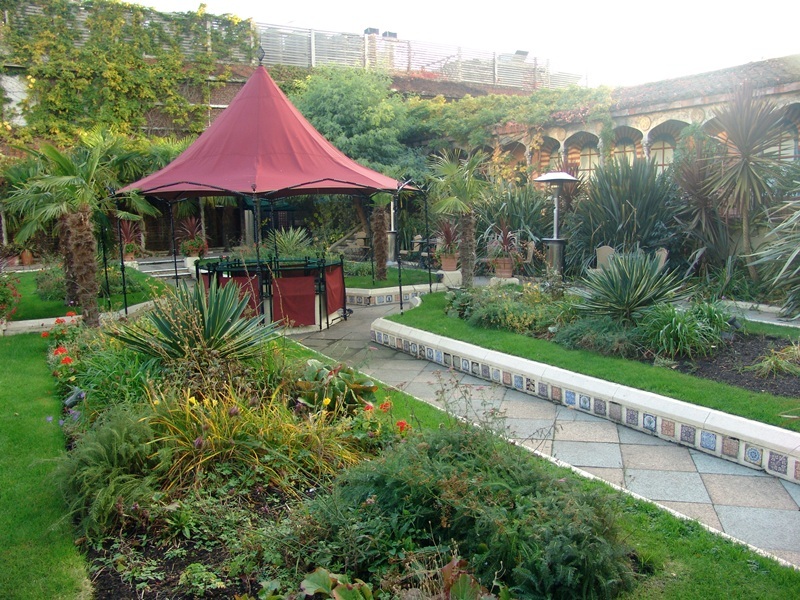 If you find yourself in London on a sunny day and you want to find a quiet place, in the center of the city but at the same time, far enough from the traffic jam and the busy streets of London, the amazing roof gardens are a perfect choice. On this, some will say unusual locations, you will find some of the most beautiful places for sightseeing and also some great restaurants and pubs. You can pop in for a morning coffee, a lunchtime refreshment or snack, afternoon sweet treat or evening cocktail. 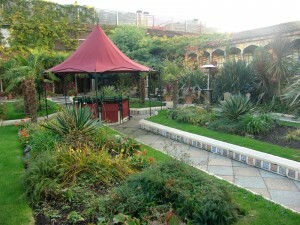 The Roof gardens are located in central London, on 99 Kensington High Street W8, on top of the former Derry and Toms building. For more than 70 years this was the largest roof garden in Europe. Kensington gardens were outmatched in 2013 by the Emporia Shopping Mall from Sweden. On 100 feet above the ground level, on the 7th floor, Kensington Roof Gardens offer three impressive attractions: a glamorous night Club, the only rooftop Private Members Club, a fancy restaurant, Babylon, where you can enjoy your meal watching the beautiful view of London horizon and of course, the themed gardens. There are three themed gardens (Spanish Garden, Tudor Garden, English Woodland) that are spanning on over 1.5 acres and create a natural habitat for over 70 trees, flowers, fish, and 4 flamingos. The gardens even have a flowing stream and are open for visit for free. 247 Heathrow Airport Transfer can offer you a transfer to Kensington High Street and the price will be £35 for a saloon car. Another vibrant garden was created on top of the Queen Elizabeth concrete rooftop, showing a beautiful view of the London Eye and the Thames. Only until October, when it will be closed for winter, you can spend a delightful evening on one of the Cafes or Bars and you can take a walk through the garden of wildflowers and fruit trees. In case you need a transfer from Heathrow Airport to Queen Elizabeth Hall’s area SE1, the price for a saloon car will be £43. Coq d’Argent Garden is located in the City of London, on 1 Poultry Street, Bank, EC2R 8EJ. The area is known in London as one that lacks in green places, on the ground level at least. That’s why the roof garden and restaurant Coq d’Argent is a popular and sophisticated eating place. The menu is mostly based on French dishes, caviar and fine wines. A transfer from Heathrow Airport to Central London EC2 costs £41 for a saloon car. The journey will take about one hour including traffic. Is located in E8, on 18 Ashwin Street and it is an eco-friendly environment (the building is powered by a few solar panels) and has an open coffee, bar and barbeque. In the summer, the Roof Park is the host of a Film Club, the Film4Free season. The membership price is only £3, an amount that goes to charity, and as a member, you get free entry to all events. If you travel by taxi from Heathrow Airport to Dalston Roof Park area, the duration of the journey will be about one hour and 15 minutes, if we take into consideration the traffic delays, and the price will be £46.